Days after his murder, Chip grabbed his fiancé while she laid sleeping. "I'm not gone, I'm right here," he told her. "You can't see me, but I am here. I'll never leave you. I promise." Guiding his sweetheart through a twisting plot into the wonder of life beyond death, Chip teaches Lyn how to read the Signs and Messages he shares from the Afterlife. His determination to communicate from the Other Side keeps her focused on his new life, instead of how he died. Chip's unforgettable visitations, creativity, and ability to leave gifts from the beyond, are remarkable blueprints for "proof of life" in the Hereafter. Filled with loss, grief, and otherworldly love, this true story will have you on the edge of your seat while you question the nature of life after physical death. "Death is not the end of who we are, my darlin'." Chip said. "Love can never die. The one Key to everything beautiful is love. Our love lives forever." Lyn Ragan knew at the age of fourteen that she would write a book one day. She subscribed to True Crime and True Detective, reading each edition faithfully while plotting her fiction novel she never wrote. Twenty-five years later, she met the love of her life never thinking she'd be involved in a real-life crime. After her fiance's murder, she followed his guidance by way of ADC's, (After Death Communications). From the other side, Chip insisted she write their story. Following her struggles with grief and added defiance, she reluctantly gave in. Through music, Chip communicated the title, and cover art, for this book. Wake Me Up Before You Go-Go by Wham, inspired the title, Wake Me Up!. Stairway To Heaven by Led Zeppelin, inspired the cover art-the photograph being titled, Stairway to Heaven. While writing her first novel, Lyn was introduced to the spiritual arts of energy work. She pursued meditation faithfully and went on to study Reiki Healing, Auric Energies, and Chakra Balancing. She later used her studies to become a professional Aura Photographer, an Ordained Minister, a Children's Book author, and a publisher. 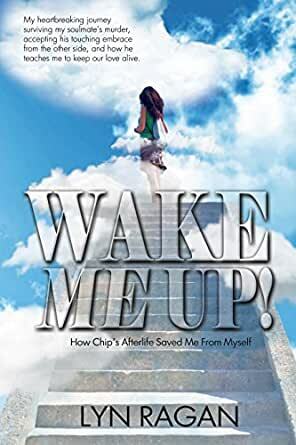 Lyn enjoys sharing her afterlife experiences with Chip and hopes their story sheds new light on continuing relationships with loved ones passed. She lives in Atlanta with her fur-kids, Scooby and Chipper. Lyn can be found online at www.LynRagan.com, and Facebook at WakeMeUpBook." Loved it. Such a heart felt story and so, so intense at times. Lyn Ragan writes from the heart and you can feel her pain as she works through the loss of her beloved man. Brilliant writing...thank you Lyn. This book was obviously written by someone who doesn't write books for a living, so it lacks some professionalism, but Ms. Ragan does a good job of explaining the horrible experience of losing her beloved to murder and then realizing that he was still with her in spirit. And she truly believes she can communicate with him from the other side. I think those who write this book off as fantasy should talk to a few more people. After my mother died, I had a very similar experience. And maybe if more people come forward with their experiences, more minds will be changed on this subject. Kudos to Lyn Ragan for being honest about what happened after her boyfriend's death. It took courage to come forth. I knew when I saw the book advertisement that I had to get it. Somehow it would help me feel less crazy for believing what was happening. I felt him, heard him, seen him, had dreams of and with him, made hearts appear everywhere for me to see as a sign. He even played tricks on me to make me smile, laugh or to remind me he was still around, still loves me & I'm not alone. When I spoke of them to people, many would look at me & smile a sad smile but many thought I lost my mind & just pretended to understand. I finally stopped talking about them & just enjoyed the times myself but they seem to come much less now but I think he's allowing me to learn my lessons & experience what I need experience. However, I still know he's always here & grateful he's able to balance me when I'm in need of him. I love you & miss you my Valentine Angel. Kisses for all eternity my love. Lost s dear one recently and have been having experiences with him. This confirmation helps me to stay present yet with him and keep moving forward. Don't know why I bought this book... I was just browsing for books to help me with the sadness and grief of my dog's passing. The pain just never goes away even though it's been almost 2 years. This book gave me much peace and also validated the many unusual "messages" and dreams that I have. The last page with Chip's message was most comforting. Lyn, thank you so much. You have really fulfilled what Chip wanted you to do and help so many of us through these difficult times. Chip, thank you too!.